Visit the touchstones of Mardi Gras culture in New Orleans historic French Quarter on a 3 hour walking tour including museum admission to the Presbytere Museum's Mardi Gras Exhibit at Jackson Square. Explore the history and origins of this festival as we visit sites central to Mardi Gras and the festival's rich history and how we celebrate it today. Also included is the admission to State Museum Presbytere at Jackson Square to see the ultimate backstage pass to Mardi Gras. At the Presbytere you will be able to see ballgowns, elaborate, antique carnival favors, a float. The perfect langiappe to end your tour. Meet at 622 1/2 Pirates Alley, behind Cabildo Museum and we will share a traditional King Cake with you. As we walk through the quarter towards the parade route, we will see mask shops and find out about the pre-christian tradition of masking and speak to how these pagan traditions are still deeply rooted in Mardi Gras history and how we celebrate it today. We will walk up Royal Street, the original Mardi Gras route of the mule drawn carriages, and still used by some parading Krewes today. We will get a glance at notorious Bourbon Street and see where Rex and Zulu kewes meet on Lundi Gras. We see famous Canal Street where the Super Krewes parade today as you can learn where the best place is to view parades, parade etiquette, what to expect and how to get the most out of your Mardi Gras. Then we will head back toward Jackson Square toward Presbytere Museum to see their private Mardi Gras Collection. 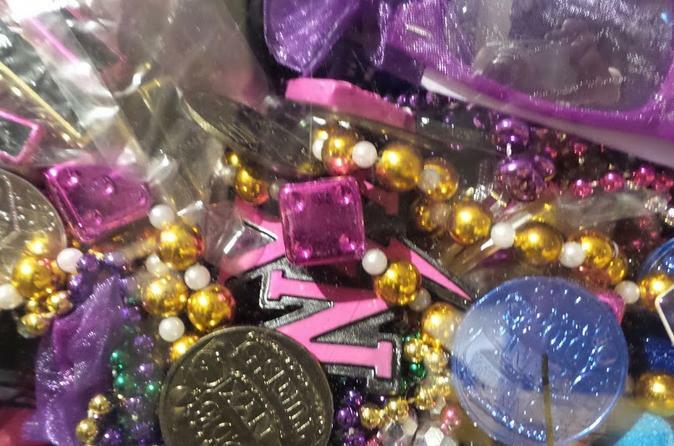 This is a world class, curated exhibit of the history of Mardi Gras both in New Orleans and in other locations that celebrate the event including hundreds of one of a kind beads, ballgowns, crowns, septers where you can see what it is like to ride on a real Mardi Gras float.